Welcome to another Saturday Interview with a Historical Novelist. 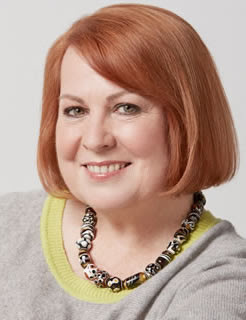 Today I have the pleasure of introducing the fascinating Kathryn Gauci. Welcome Kathryn. Please tell us, why did you choose to write historical fiction? I have always loved history; to be transported to another time and place and learn about how others lived. After all, our own ancestors lived through these times and when we think of that, history is not as remote as we think. It is what shaped us. 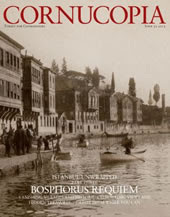 What in particular fascinates you about the era you write about? Since living and working in Greece and studying Turkish culture through my work as a textile designer, I grew to understand the tensions between Greek and Turks. They have a shared history over several centuries, yet politics caused great upheavals leaving behind a legacy of hatred and bitterness that is only just subsiding. I did write a couple of short stories when I was about thirteen, which I still have but my writing life really began when I had my textile design studio. A part of this work entailed presenting trend directions to my customers. These often meant that I had to create the ambiance in which particular trends were set. That could be anything from the many historical periods, to ethnic/tribal cultures, tropical or Nordic winters. There are two. The haunting music from the Turkish film, Gallipoli by Demir Demikan, and the “Orchestra of Colours” playing music from Greek composer, Manos Hadzidakis’ Giaconda’s smile album played on Santorini 1999. I am never short of ideas but its actually sitting down and getting on with it all. It takes discipline. It’s not easy. There are pitfalls to finding a good company to go with and much as you try to navigate the hurdle, in the end you learn by your mistakes. There is always a light at the end of the tunnel though and connecting with reputable writing groups online such as Alli, is helpful. We can learn from other people’s experiences. Apart from that, Its not easy to get your book out there and you need to be constantly promoting it. I love my home and spending time with my husband Charles who is a magician, and thankfully understands the highs and lows of the creative process. If I have time – which is rare – I like to make glass jewellery, both kiln-formed and flame-worked, which I have been fortunate enough to sell in a wonderful glass gallery in Melbourne. I also enjoy curling up on the couch and watching the old classic black and white films, especially film noir, and foreign films, in particularly French ones as they often have unusual story-lines. My cat, Rani. And the crazy parrots, lorikeets and galahs that squabble over the food on the bird table outside my kitchen window. From the past; Christopher Columbus, Suleiman the Magnificant, Richard Burton (the adventurer, not the film-star), one or two notorious spies, Cezanne and Picasso. From the present: David Attenborough, Merryl Streep and Helen Mirren, Simon Callow, Alistair Sooks and Mary Beard. I know, it’s a big dinner party. What else would you like us to know about your book? 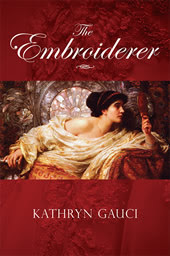 The Embroiderer has been picked up by a Greek publisher and will be available in Greek next year. SilverWoods Books in the Uk produced the book. I had the manuscript edited before I sent it to them but it still needed tidying up. They did an excellent job and the quality is first-rate. Before turning to writing full-time, Kathryn ran her own textile design studio in Melbourne for over fifteen years, work which she enjoyed tremendously as it allowed her the luxury of travelling worldwide, often taking her off the beaten track and exploring other cultures.The Embroiderer is her first novel; a culmination of those wonderful years of design and travel, and especially of those glorious years in her youth living and working in Greece – a place that she is proud to call her spiritual home. Published by SilverWood Books Ltd.
As soon as I saw the word “textiles” I was in. I love interesting fabric and textures or prints in it. No wonder the setting appealed to her. So nice to meet Kathryn. Lovely interview Christoph. Mega hugs. What a well rounded life Kathryn has lived. The book cover of The Embroiderer is very compelling, and I wish Kathryn huge success with this book, whose subject matter is unique. Christopher: should you be in need of an author to interview, I’d love to introduce you to my contemporary fiction novel set on the western coast of Ireland! Consider me standing in line! Christoph Fischer​ with his guest Historical Novelist Kathryn Gauci.. pop over and read this interesting interview. What a fascinating interview. Thank you Christoph and Kathryn. How wonderful to have more than one creative talent. A really fascinating interview, indeed. The book sounds intriguing. I wish I had so many different creative talents – textiles, carpets, jewellery. Wow.